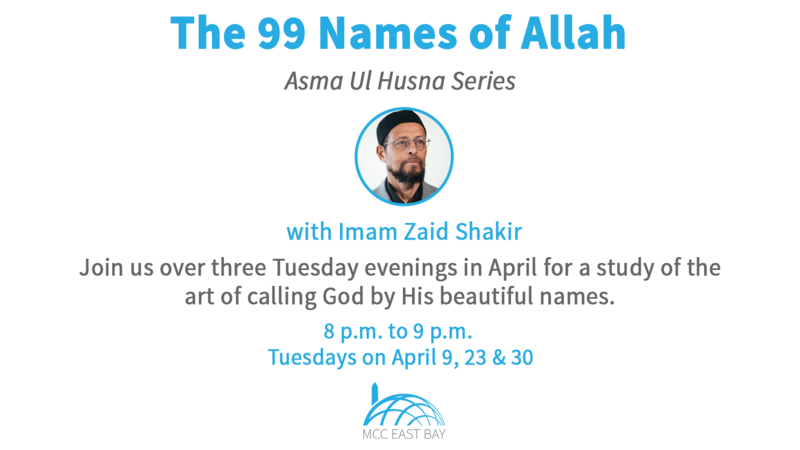 Join Imam Zaid Shakir over three Tuesday evenings in April for a study of the art of calling God by His beautiful names. 8 p.m. to 9 p.m. | Tuesdays on April 9, 23, and 30. Imam Zaid is traveling on April 16. We will not have a session on April 16. Past recordings in this series here. In these three verses Allah is informing us of His Beautiful Names and telling us to use them, to call Him with them. This is something Allah has given us and so we should know the names by which we can then call upon Allah. Fulfill the command of Allah in the Quran – to call on Him by them. The Prophet (SAW) said, “Allah Most High has 99 names – a hundred less one. Whoever encompasses them enters paradise.” Bukhari and Muslim. This is a Prophetic reminder to pay attention to these names. What does it mean to “encompass them”? Clothe oneself with these names (know them). The scholars wrote many treatises about the 99 names from the early days of Islam – Imam al-Ghazali, Imam Sanusi, Imam Zarruq and Imam Qurtubi. Abu Hurayrah mentioned the 99 names in Tirmidhi – the famous 99, but he also has another hadith mentioning 99 names some of which are different. A better way of approaching it may be to say “from Allah’s names, there are 99″. As the Prophet (SAW) didn’t narrate all 99 names in one particular hadith, the question raised by scholars is whether all the names are narrated by the Prophet (SAW) or were some from the Sahaba using ijtihad? These 99 names in particular are used for worship and a means of drawing close to Allah. Knowing Allah is the Greatest type of knowledge as it is the highest knowledge – Allah says, “I have not created the Jinn and Humans except “li ya’budoon”. In his famous Tafsir, Ibn Abbas says that “li Ya’budoon” means “li ya’rifoon” i.e. to know. This makes the verse mean, I have not created the Jinn and Humans except to know Me. Therefore striving to know Allah, within the boundaries – al ‘ajzu ‘anil idrak, idrak (the inability to know [Allah] is knowing) – is the purpose of creation. When we talk about knowing Allah we don’t mean in a way of knowing people because Allah is unlike His Creation i.e. Allah is beyond directions and places, Allah is not affected by time and space, rather He is the Creator of time and place, Allah is not a substance and has no parts etc. This is part of ‘ilmu tawheed (the science of the Oneness of Allah) – all of His Names point to His Oneness. The Names are revealed to us for a reason i.e. so that we get to know Allah by them and call Him with them. Whilst we know Allah through his names and attributes we don’t know his dhaat i.e. His Essence and shouldn’t start trying to make enquiries into this as it is beyond our scope of knowledge. We confirm Allah but preceding it with negation – la illaha illallah. When we recite Quran and come across one of Allah’s names – we should pause and reflect. The name points to the one named, and tells us about some meaning possessed by the one named – Allah i.e. Ar-Rahman gives us the perfect attribute of Mercy for Allah. Each of Allah’s names is different, some are opposites, some are complementary and they have a different affect on us – hence we are told to call upon Allah by His Names. This is a form of worship and our worship of Allah benefits us – it has no affect on Allah. Learning something is the key to acting upon it and we learn so we can practice more and this practice will lead to an increase in our faith. Some people have a certain connection to a particular name of Allah i.e. al-‘aleem (the All Knowing), ar-Razzaq (the Provider of Sustenance), al-Fattah (the Opener), al-Wahhab (the Giver of Gifts)etc. These names can help you overcome tribulation, bring a sweetness to worship, stop you from falling into disbelief. Allah gave Himself His Names. His names are intrinsic to Him and cannot be separated from Him. We can’t call Allah names of our choosing. If we say the sahaba gave Allah names, the answer is that they derived names from Allah’s attributes which were accepted by the Prophet (SAW). The names of Allah are in Arabic. This is when they are effective, translating them in English isn’t fulfilling the condition of calling Allah with His Names because the English isn’t Allah’s name i.e. The Creator (al-Khaaliq) or The Gift Giver (al-Wahhab). We can share the outward meaning of Allah’s names i.e. Rahma, but not the reality of those names. Asmaau dhaat – Names of Allah’s entity, names that point to Allah himself and do not refer to a specific meaning beyond that – this is the name Allah. Asmaau sifaat – Names of the attributes – names that affirm a meaning that Allah necessarily possesses i.e. He is the All-Knowing (Al-‘Aleem), Allah has always possessed this attribute in eternity. You don’t say this is Allah himself nor that this is other than Allah. So Allah is not Knowledge but Allah has always had the attribute of Knowledge since eternity and so it cannot be separated from Him. Asmaau tanzeeh – Names of Transcendence i.e. Allah being the exalted (al-‘Ali), the Pure (Al-Qudoos) – confirm Allah being free of that which does not befit Him of meaning. This is the original, personal name of God, no one can take on this name, the name of Allah incorporates the meanings of the other names. When you say Allah you include every attribute. This is the greatest name of Allah and the personal name of God who is the necessary existent (waajibul wujood). The one alone who is worthy of worship. The name of Allah befits only one – Allah. No one can imagine calling themselves Allah. It is unique and has not been taken by any who claim divinity. There is no translation to Allah. Ilah – god, aalihat – gods, but Allah does not mean God or The God, according to the majority, as a few may suggest. Al-ismul jaamia’ – the name pointed to by all the other names is Allah. Sultanul asmaa – the Master of names. This name points to the meanings, perfections and realities of all the other names. Continual attachment to Allah both outwardly and inwardly – knowing you are Allah’s creation and you are a mere possibility existing only because of Allah then you attach yourself to Allah outwardly and inwardly by attaching yourself to that which Allah is pleased with. Everything created perishes! When you say Allah – you think of Allah and all His attributes. Lafdhul jalala – Name of majesty – Heaviest of the names. The word Allah has no diacritical marks – neither does Muhammad. The name Allah always points to Him. Remove first alif you get lillah (for/to Allah), if you remove the laam you get lahu (to Him), if you remove the other laam you get hu (Him). That ha which you are left with is a circle – this symbolises His power. Every letter in Allah’s name points to Allah! This name burns lusts – maintain dhikr of Allah to burn them away, 7 times after each prayer has been mentioned by the Gnostics. Some of the knowers of Allah would maintain dhikr of Allah between prayer and work, constant dhikr of Allah as their heart beats. Make your breaths dhikr of Allah and Allah will remove any diseases from your heart.